Watching a lunar eclipse is an incredible experience and photographing it is even more exciting. Capturing the moon as it transitions into a beautiful and colorful moon is thrilling. When I was photographing a lunar eclipse, I watched the full moon as it slowly darkened, turning a stunning deep orange color. The eerie experience moved me as I observed it transition from a bright full moon into a full lunar eclipse. 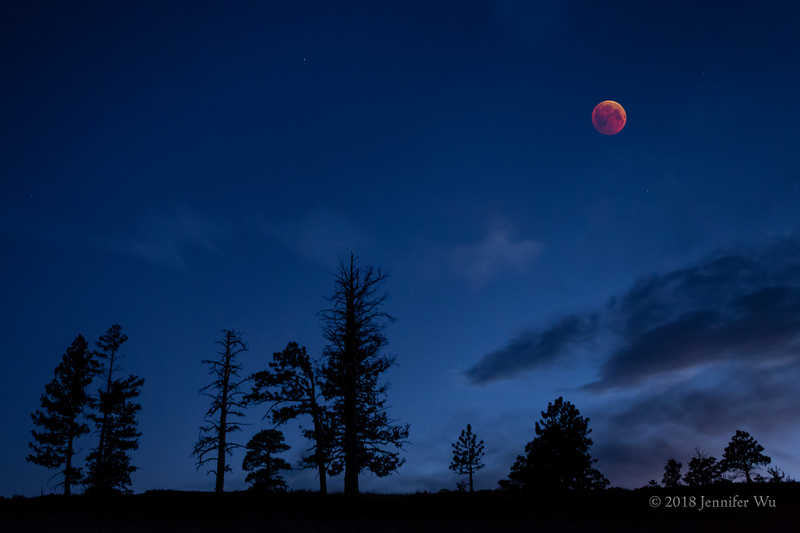 I will share with you information on lunar eclipses and what I learned while photographing them. What Creates the Lunar Eclipse? The lunar eclipse occurs when the sun, the earth and then the moon align. A lunar eclipse only occurs during a full moon, when the moon moves into the earth’s shadow. Normally, the full moon is visible due to direct sunlight on the moon and the light being reflected back to Earth. However during an eclipse, the earth blocks the direct sunlight from hitting the moon and being reflected back to Earth. Only the dim indirect light hits the moon. What we experience as moonlight is actually a reflection of the sun’s light on the moon. The above illustration shows the alignment of the sun, Earth and moon during a total lunar eclipse. The earth is casting a shadow on the moon and blocking any direct rays of light from hitting the moon. This area is called the umbra shadow area. This dim indirect sunlight on the moon is reddish in color. The color is due to the light passing through the earth’s atmosphere, filtering out the blue and other colors, leaving the red and orange tones. 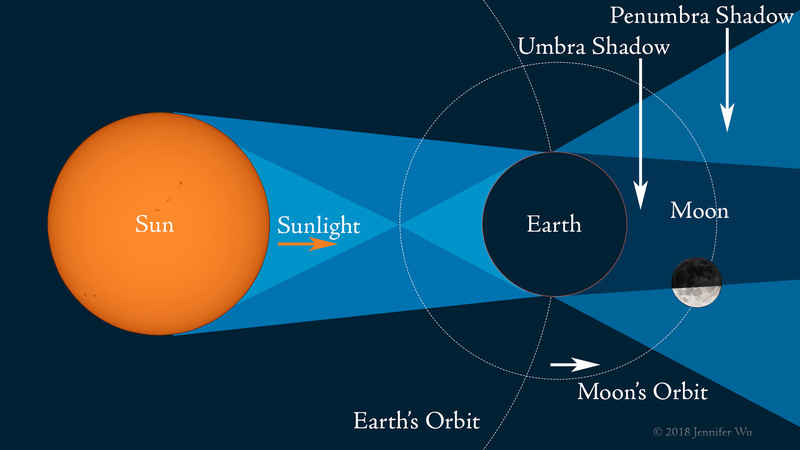 The moon then moves completely into the umbra shadow area and this causes the total lunar eclipse. The size and distance are not to scale in these illustrations and composite images. The earth’s shadow has two parts, the umbra and penumbra. The umbra shadow completely shields any direct sunlight on the moon. However with the penumbra shadow, sunlight is only partially shielded. The above illustration depicts what happens when a portion of the moon passes from the penumbra shadow area into a part of the umbra shadow area, leaving a partially lit moon. Part of the moon is in the darkest part of the earth’s shadow in the umbra, and the rest is in bright light in the penumbra. This is called a partial lunar eclipse and it is easy to see. It looks similar to a partially lit moon, such as a crescent or half moon. The exposure difference between penumbra shadow area and the umbra shadow area can be significant. I can obtain a proper exposure for either the bright part of the moon or the shadow. The penumbra lunar eclipse is when the moon moves fully into the penumbra shadow area. This is difficult to see because the shadow or darkening of the full moon is so slight. It looks similar to a normal full moon but with a barely noticeable darkening. 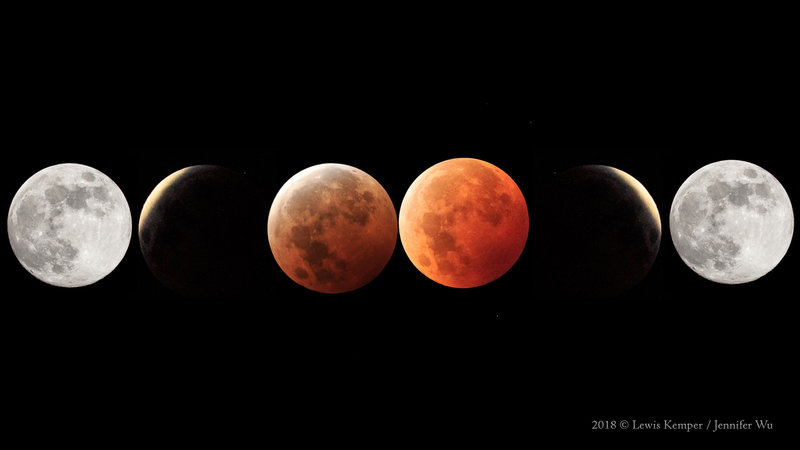 Lunar Eclipse Composite - The image above is a composite showing some of the phases of the moon as it would look going from a full moon to a total lunar eclipse and back to the full moon. Notice the sliver of sunlight reflected on just part of the moon before it goes into the full eclipse. This easy to observe phase is called the Partial Lunar Eclipse. Credit: Lewis Kemper. When to Photograph the Eclipse? You can find out the dates for when future lunar eclipses will be visible and timeframes by visiting the National Aeronautics and Space Administration(NASA) Eclipse, Timeanddate.com, or US Naval Observatory, US only. On the NASA site, under the column for “Eclipse Type” look for a total eclipse and then check the column for the “Geographic Region of Eclipse Visibility” to see if it will be visible in your area. Total eclipses often occur in a set of two or three in a row over many months but in different areas on the planet. The set will reoccur approximately every two and a half years. Thus, in any given area on the planet, a total eclipse can be seen once about every two and a half years. Eclipses are visible from different areas on the Earth’s surface. There will be a total lunar eclipse on July 27, 2018 that’s visible in parts of Africa, Asia and Europe. The next total eclipse that can be seen in North and South America including the United States will be on the night of January 20, 2019 and the hours before sunrise on January 21, 2019, information here. Keep in mind that for this event, if it is listed that the eclipse will occur on January 21, 2019, that means it will happen in the early morning hours before sunrise and not after sunset on that day. The total eclipse will last about one hour and two minutes. So even if there is cloud cover in your area it may clear up during some portion of the eclipse. The full event should be visible in all states except Hawaii. In Hawaii, the total eclipse will be visible at moonrise (after sunset) but the penumbral lunar eclipse and partial lunar eclipse occurring before moonrise will not be visible. Often a solar eclipse will occur around two to three weeks before or after a lunar eclipse so keep an eye out for that too on the NASA site. 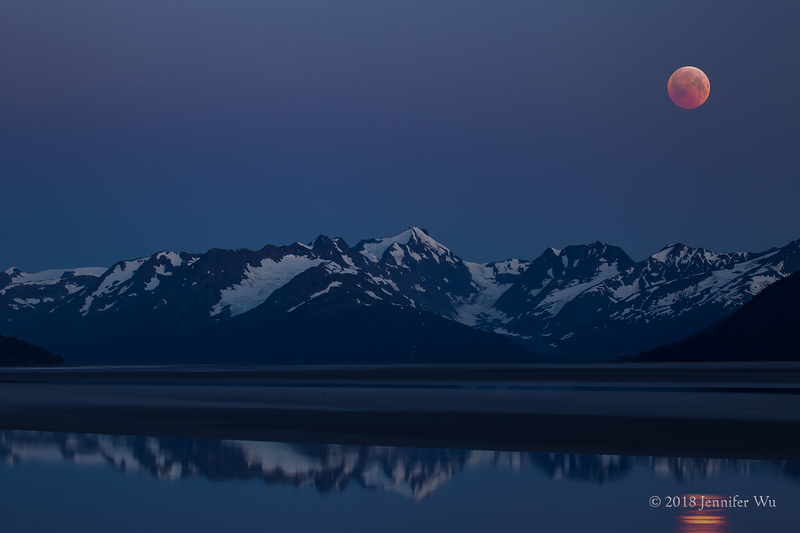 Alaskan Mountains and Eclipse Composite - This composite consists of one image photographed at twilight and another of the eclipse. The two images were combined using the method mentioned in this article. Eclipse photographed at 0.4 sec, f/5.6, ISO 2000. Twilight image photographed at f/16, 2 seconds, ISO 100, EF 100-400mm f/4.5-5.6L IS USM at 100mm, Canon EOS 5D Mark II. Images are not to scale. You can determine where the moon will be in the sky at a particular date and time by using any of the following of apps: Starry Night desktop (I use this for planning), StarWalk 2 or the free desktop app, Stellarium. To line up the eclipse with your foreground elements, the following apps show the moon overlaid on a map of your location: PhotoPills and The Photographer's Ephemeris or 3D. 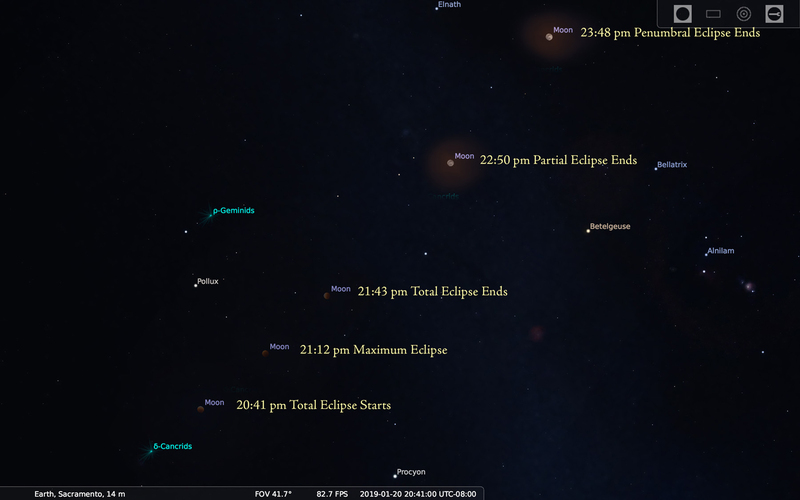 StarWalk 2 and PhotoPills allow you to see where the location of the eclipse will occur in the sky when pointing your mobile device at the sky. Enter your location, the date and beginning and end times of the eclipse to see its path through the night. Alternatively, you can see the position of the moon by going out the night before and viewing where the moon is located 50 minutes prior to the eclipse start time. The moon rises 50 minutes later each night than the night before, so viewing it at this time will allow you to judge fairly accurately where the eclipse will occur on the following night. The moon will shift slightly in a twelve-degree arc further east the following night. If possible, I prefer to go to a location with full eclipse time close to sunrise or sunset so the path of the eclipse is not too high in the sky, to avoid shooting overhead. This free app is easy to use for planning your eclipse photographs. Here I changed the time (in the date and time window) to see the moon in the sky in Sacramento, CA as it will be on January 20, 2019, as it transitions from full moon to eclipse and back again. The path is continued in the second image as I moved up the scene from the first image. Notice the path of the moon as it moves from the east to the southeast and higher in the sky during the eclipse. Enter your location to see where the eclipse will occur in your area. Can I Photograph the Eclipse in a City? Unlike photographing the Milky Way, which is best in dark areas away from city lights, the full moon and the lunar eclipse are both highly visible in cities, despite the light pollution generated. It is still possible to get excellent lunar eclipse photographs from a city. In order to do so, find a location away from bright light sources and avoid lens flare caused by direct light shinning on the front element of the lens. No special filters are necessary for photographing the lunar eclipse, unlike a solar eclipse that requires one. However, if you are photographing in a city or near city lights, there is a filter that helps reduce light pollution. The night sky filter from Breakthrough Filters helps neutralize high-pressure sodium city lights and will reduce the orange colored haze visible in night sky photographs. This filter works best with telephoto lenses. 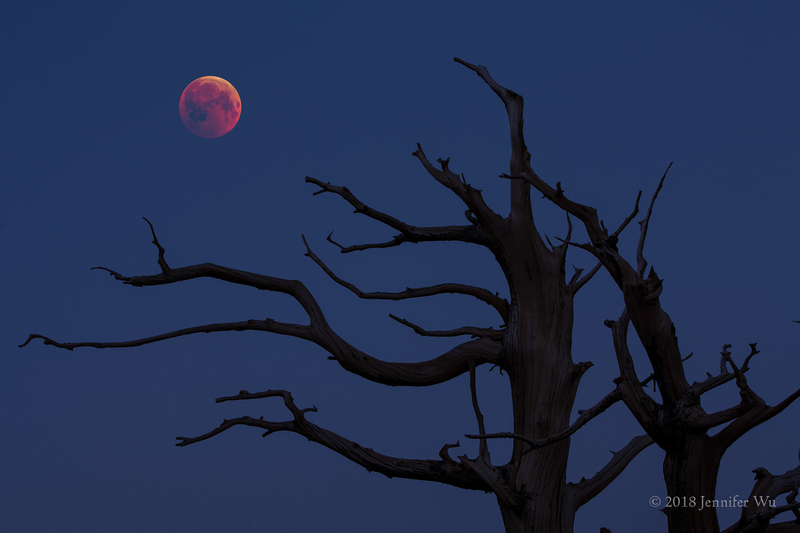 Bristlecone Pine Trees and Eclipse Composite – The trees were photographed in the White Mountains, CA at twilight and combined with a lunar eclipse photograph with the method mentioned in this article. Eclipse photographed at 0.4 sec, f/5.6, ISO 2000. Pine trees photographed at f/11, .04 sec, ISO 100, EF 70-200mm f/2.8L IS USM at 85mm, Canon EOS-1Ds Mark III. Images are not to scale. While in Hawaii some time ago during a winter eclipse, I was unable to see it due to clouds. It didn’t help that I was in an area with high average monthly cloud cover. Since you might be unable to view the eclipse due to cloud cover, you may want to travel to an area where there is a greater possibility of clear skies. Use Weather Spark to check your locations for the days with the most clear skies or low cloud cover percentage during the month of the eclipse to determine the best weather locations. Deserts can provide good locations as they can have fewer clouds and less humidity, creating better atmospheric conditions for a sharper and brighter moon. However, be cautious if the area is prone to dust storms. Anywhere you can see the full moon, you can photograph the eclipse. There are many beautiful locations to choose from for photographing the eclipse and its sequence. You can photograph just the full lunar eclipse or the entire sequence as it transitions from a normal full moon into the eclipse and back again into the full moon. When photographing the sequence, check the path of the moon for your location with the resources mentioned, so you can frame your shots with that movement in mind. If possible, scout it out beforehand and take some test shots. Check for anything that would obstruct your view. Compose your image. Look for compelling subjects like trees or boulders to use as silhouettes; or mountains or an old barn that can add interest. If you are in a city, an iconic building or bridge can add to the scene. When taking your test shots, decide what focal length lens you want to use and leave space in the sky for the eclipse. Trees and Eclipse Composite – The trees were photographed at twilight to get the silhouettes at Bryce Canyon, UT. I combined this image with a photograph of the eclipse with the following method. The trees were photographed at f/2.8, 1/40th sec, ISO 10,0000 (I would not recommend this high an ISO setting and instead use a lower ISO), EF 24-70mm f/2.8L USM at 30mm, Canon EOS 5D Mark III. Images are not to scale. To create a lunar eclipse composite, find an interesting location and take photographs at twilight, after sunset or before sunrise. You can use images of stars or by moonlight too. You can then combine this base image with photographs taken during the eclipse in Adobe® Photoshop®. Once you have your file in Photoshop, drag your base layer to the bottom of the layers panel. Change the blend mode to Lighten on all other layers to allow all the lighter areas in the images to appear. You will see the bright moon appear in the image when you do this. You can do this with just two images or multiple images to combine phases of the eclipse into one image. If desired, resize an eclipse photograph by pressing Command T (Mac) or Control T (PC) to bring up free transform. Resize the image by pressing and holding the shift key while dragging the corner of the eclipse to the desired size. If needed, you can reposition the moon by clicking on the layer with the moon you want to move and use the move tool (press v key) and click and drag to a new area. 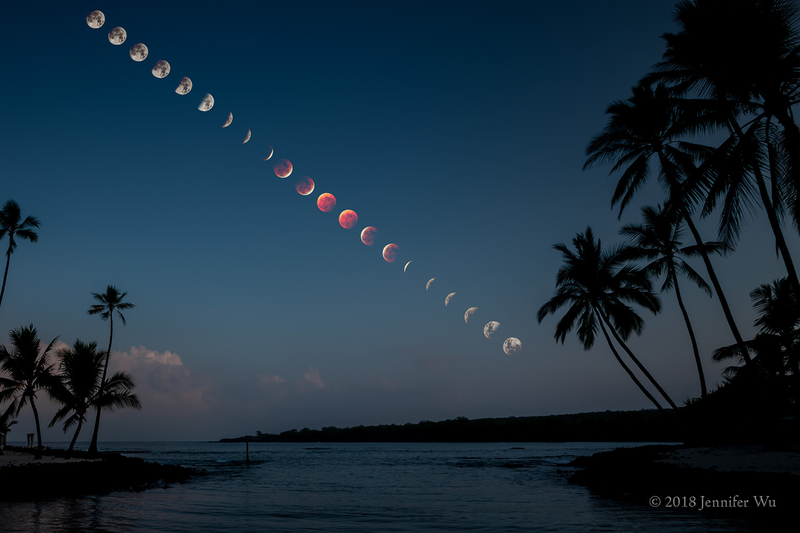 Big Island Hawaii and Eclipse Sequence – This eclipse sequence is for illustration purposes, to show what a composite might look like. Images are from two different eclipses and not to scale. Various exposures were made on the eclipse photographs and combined with the aforementioned method. Palm trees photographed at f/16, 1/6th sec, ISO 50, EF 17-40mm f/4L USM at 17mm, Canon EOS-1Ds Mark III. To make composites images realistic, photograph the twilight or night-time image with the same focal length lens as you are using to photograph the eclipse. This will be your base image and retain the proper perspective when the moon is inserted into the frame. It can be helpful to keep your tripod and camera in the same position for both the twilight or night image and eclipse images. Make sure to have a sturdy tripod to keep the sequence of images in alignment. Be careful to not knock the tripod when adjusting exposures, like I do. You can photograph the eclipse with a telephoto lens to get just the eclipse sequence large in the frame and later make a composite if desired. Alternately, with a short telephoto or wide-angle lens you can show the path of the eclipse sequence with a landscape shot. I suggest taking photographs about every five minutes with a telephoto lens, and about every ten minutes with a wide-angle lens, depending on your spacing preferences. This will allow for a nice separation in the image of the various phases of the eclipse. Use a timer or watch to take the photographs at the interval time and change the exposure as needed for each image. 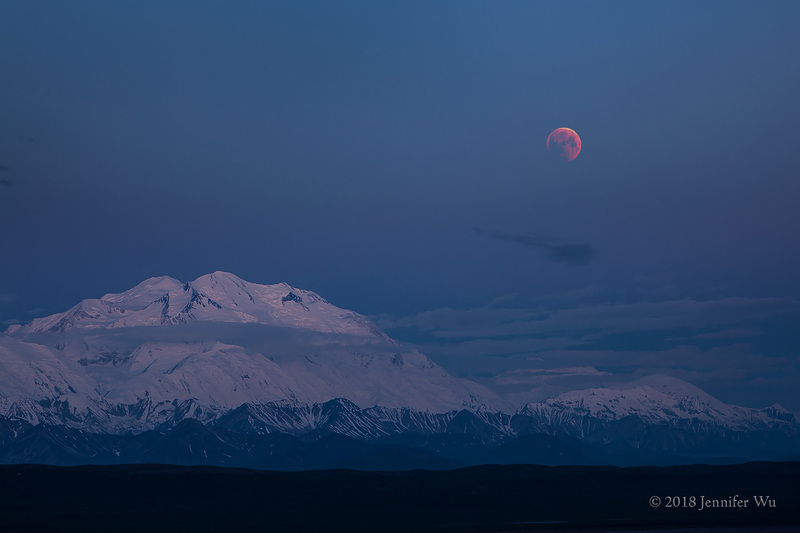 Denali National Park and Eclipse Composite - This composite consists of one image photographed at twilight and another of the eclipse. The two images were combined using the method mentioned. The twilight image was slightly cropped and photographed at f/8, .8 sec, ISO 100, EF 24-70mm f/2.8L USM at 70mm, Canon EOS 5D Mark II. Images are not to scale. To learn more about how to photograph the moon, equipment, settings and lens selection, please first read my article on Photographing the Moon. Before the lunar eclipse occurs, I suggest practicing taking photographs using Manual mode of the full and crescent moons then reviewing them for sharpness. I do not recommend using automatic modes since it can overexpose the moon. By doing this, you will know which settings produce the best results with your gear. Full Moon: f/11, 1/100th sec, ISO 100 or for higher ISO: f/11, ISO 200 and 1/200th sec. Partial Eclipse: f/5.6, 1/125th sec, ISO 100 for the half moon. Then decrease the shutter speed as needed to 1/60th or 1/30th sec for a quarter moon. Check that the movement of the moon doesn’t make it look blurry if using long telephoto lenses. Next adjust the exposure by raising the ISO, by increments of 1/3 or 1/2 stops as needed as the moon transitions into a full eclipse. I recommend not going over 6400 ISO. 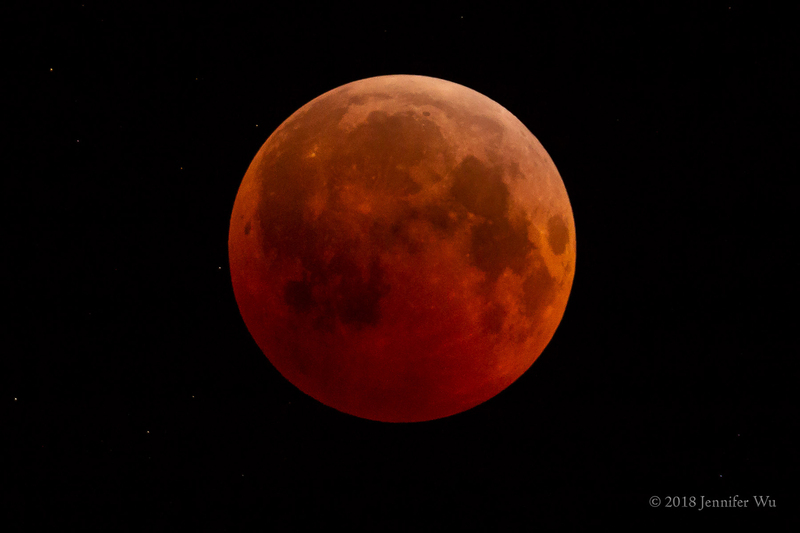 Full Eclipse: A good starting point for properly exposing a full lunar eclipse is f/5.6, 1/8th sec, ISO 2000 or higher. Use a wider aperture if your lens allows it. To stop the movement of the moon, you may need a faster shutter speed with telephoto lenses. The longer the focal length of the lens, the faster the shutter speed will need to be to stop the moon’s motion. Use the 500 Rule or faster shutter speed as mentioned in the article Photographing the Moon. For a wide-angle lens you can use a lower ISO and longer shutter speed such as 8 seconds. If you have a camera-tracking mount, this will allow you to have much longer exposure times and consequently less noise. For photographing the eclipse sequence you will need to constantly adjust the exposure as it changes through the eclipse. Keep in mind that exposure settings can vary as much as two stops due to different atmospheric conditions. For example, thin cloud cover, dust particles, moisture and pollution. Remember to fully charge your battery and have an extra, if available. Keep the backup battery warm in your pocket to preserve its shooting time. Photographing the whole event can take around five hours. Bring what you need to keep yourself comfortable including warm clothes, chair, insect repellent, water, food, red-headlamp, watch and timer. 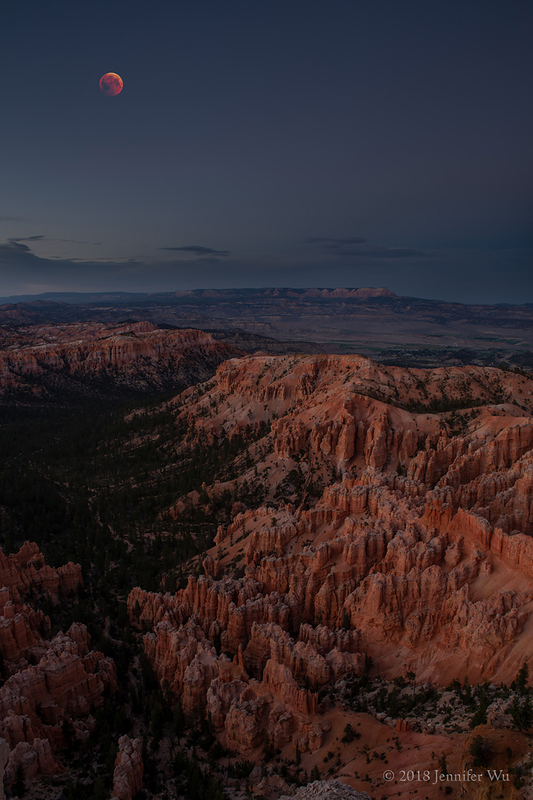 Bryce Canyon and Eclipse Composite – This composite consists of a photograph at twilight and a lunar eclipse from another night. Twilight image photographed at f/11, 3.2 sec, ISO 100, EF 24-70mm f/2.8L USM at 24mm, Canon EOS 5D Mark III. Images are not to scale. The lunar eclipse is nicknamed the blood moon for its incredible color. Atmospheric conditions cause the moon to vary in color and brightness. It can appear to be very dark—almost not visible, a dark brown or grayish color, rust, or brighter tones of red or orange color. The Blood Moon - Lunar eclipse photographed at 0.4 sec f/5.6, ISO 2000. Lens 400mm, f/4 DO IS USM +1.4x Teleconverter for 560mm actual focal length, Canon EOS 60D, cropped. Here’s to great shots of the moon and future eclipses!